Almost every day another adventure. Since I knew that I would be out of the country for 11 weeks I knew that I couldn’t bring enough cash with me to see me through. Using credit cards and ATM cards is OK for a week or three but those charges for exchange and extraction of cash really start to add up after awhile. So I talked to Luca at the school before I came about the possibility of opening a bank account here for temporary use so that I could do one or more wire transfers to provide all of the funds that I would need while out of the country. At first I had planned to bring about $1500 or so with me and change it into euros when I got to Germany – the first stop on the trip. I had a call with my friend Marion before I came and she said that changing paper would cost some percentage points more than doing a wire transfer. So I did a wire transfer to her bank in Germany and she handed over the cash when I got there. One word of advice, make sure that the money transfer is in euros rather than dollars. Otherwise the European bank will take too big a bite out of the funds when they convert to euros. I found that my broker, Charles Schwab, charged less than my bank to transfer the funds, having done this both ways. So now that I’ve been in Italy for two weeks it was time to face up to opening the account. There are different varieties of accounts in Italy. I was first advised to get an Italian tax number (un codice fiscale) so that I could open a regular checking account (un conto corrente). Talking to someone else at the school I found that there were two problems with this. One: I would also need a residency permit (permesso di soggiorno) which I don’t have and don’t need for the duration that I will be here. Two: a full fledged checking account costs 10 euros a month. Besides that, I don’t need a checking account – just a place to receive cash with a wire transfer and stash it rather than under a mattress. So I found the solution. I opened a SPIPER account. I don’t know if this is a generic name or is specific to the bank where I have the account. I get what amounts to an ATM/debit card. The card basically represents cash. You load it up with what amounts to cash. It is widely accepted. So when I opened the account I charged it with 200 euros. So it’s like I’m carrying around 200 euros (gotta find out how to write that symbol) that I can use just about anywhere. I can recharge the card, just like recharging a cellphone here by just going on line and loading it up from funds in the account. The total cost is 10 € a year (aha – I found it!). The security for this thing is quite something. Italians, apparently have a great distrust of institutions.You can hardly blame them. After all this is the country of Berlusconi! Online purchases here are much less than the U.S. because people distrust the security of the internet.There is a special aspect to this. The Italians, I’ve been told by the some Italians themselves, trust family above all and the trust gets lower and lower as that group enlarges. So banks are pretty low on the list. So there are 3, count ’em, 3 levels of security including a little key that uses some kind of algorithm to produce an 8 digit number which is different every time the key is pressed. When you go on-line to view your account and perhaps recharge your card then you press a button and, presto, there is you number code that you need to enter as well as the two passwords. 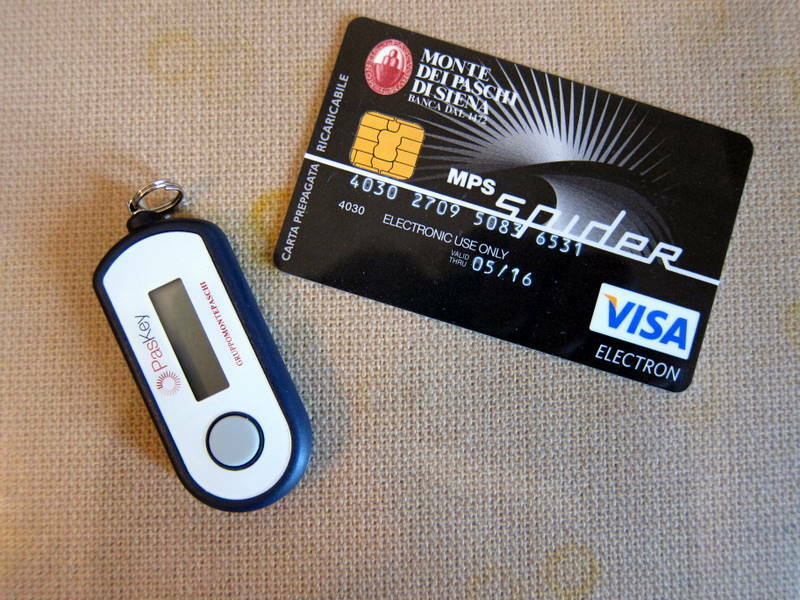 The photo below shows my new card (with integrated chip for additional security) as well as the little passkey. Ah yes. The title of the post – my OLD bank. My bank “Monte dei Paschi di Sienna” is the oldest surviving bank in the WORLD. It was founded in Sienna in 1472. This entry was posted on Thursday, September 22nd, 2011 at 10:56 pm	and is filed under Culture, Travel. You can follow any responses to this entry through the RSS 2.0 feed. You can leave a response, or trackback from your own site. I use to feel so wealthy when I visited Italy because everything was in Lira. Yeah, nothing like having 100,000 in your pocket, eh? This is good info, Joe. Thank you. All the fees can get out of control, and I was trying to figure out how to get around those during my next trip to Italy. I haven’t done any research on this yet, but another solution might be to open an account with a bank that has branches in both the US and Europe. At this point I don’t know which banks (if any) are in both countries, but one would also need to make sure there are operating branches in the places you want to go – that may be the real trick! I’m not sure about the international bank possibilities or that there are really any advantages to going that route. It was really quite easy to open my account here. I just went to the bank with the passport and walked out a half hour later with the account (for 10 euros a year – a real bargain) and a card loaded with 200 euros. As I noted, my bank in the U.S. was more expensive in terms of doing the wire transfer. Schwab on the other hand was quite economical. Very low costs. I really recommend this route for anyone who wishes to spend significant time in Italy. Note that there is a $25 fixed fee for the transfer so the more you transfer the lower the percentage costs. My transfer was 3500 euros so the percentage is miniscule (about 0.5%).